What is the greatest adventure you could ever dream of? Many might say something like climbing Mt. Everest, climbing Denali, or maybe climbing an obscure route in a place like China. Others might say skiing some secret hidden peak. And others might want to kayak or surf or paraglide somewhere that's "out there." A few hardy souls might even want to combine sports to fulfill a dream. There are those who think outside the box when it comes to great adventure. And then there are those who think way outside the box. 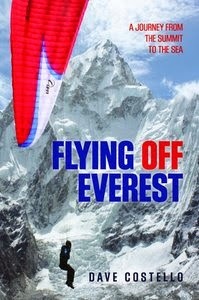 Dave Costello's Flying Off Everest chronicles one such adventure. Sano Babu Sunuwar and Lakpa Tsheri Sherpa -- two Nepali friends -- decided that they should climb Mt. Everest, paraglide off the top, and then kayak down a river to the ocean. Babu was a strong whitewater kayaker and a paraglider, whereas Lakpa was a mountain guide who'd climbed Everest before. The problem was that Babu didn't know anything about climbing. And Lakpa didn't know anything about boating or flying. The result...? The pair set-off to complete a world class adventure with no real sponsors, no money, and limited skills. In March 2011 Squash Falconer and Rodrigo Raineri were poised to be the next paragliding pilots to fly from the summit of Everest, comfortably backed by corporate sponsorships and the resulting media attention. Lakpa and Babu had just decided to beat Falconer and Raineri to it, though, over several bottles of Carlsburg beer and dal bhat at the Pokhara Pizza House, even though they had no plan, or money for that mater, to do it. They didn't have any corporate sponsors. They didn't even have the basic gear they would need to complete the expedition. Neither of them actually owned a tandem wing capable of flying off Everest, and they still had no boat they could paddle together to the ocean, even if they did manage to find an ultralight wing and somehow, climb and fly off Everest with it. And though it was touch and go on the mountain with Babu fighting mountain sickness and both of the men fighting the fear that their paraglider wouldn't arrive in time, they were ultimately successful. They paraglided off the top of the peak and didn't crash. Indeed, they were so successful that they nearly blacked out after being swept up even higher than the top of the tallest mountain in the world into air that was so thin a person acclimatized to lower altitudes would have quickly perished. Obviously, flying off Everest was only part of the adventure. The pair finally got a kayak and embarked on the next part of their expedition. After giving his quick introduction to whitewater safety, Babu clambered into the back of the two-man kyak and prepared to paddle a boat that was nearly twice the length of the kayaks he was used to into a Class IV big-water maelstrom with someone who had no idea how to even swim. Though it often feels like a comedy of errors, the pair ultimately succeeds on their adventure and are awarded the status of National Geographic's Adventurers of the Year. Costello's tale takes us beyond the adventure. It also takes us into the lives of these two Nepali men, into their careers and into lives of their families. We get to know these men and we get to know the world of high adventure that they both live in. There is one question that Costello's book never addresses head-on. And that is, "why?" This is the age old mountaineering question and we all answer it in our own way. But Nepal is different. Most of those who climb in Nepal do it as a job. This is also the case with raft and kayak guides. The planning of grand adventures tends to be something of a hobby for those who come from developed nations. So why would two Nepali men attempt something like this? We can extrapolate reasons from the text. The pair appear to be just as excited about a great adventure as those from North America or Europe. But they also appear to believe that an adventure like this might make them rich, which is not at all the way that an individual from a first world country would think. It would have been interesting to dig a little bit deeper into these motivations and to find out why they believed that they would find fortune at the end of their adventure.